This Add-in for SharePoint and SharePoint Online provides a form that users can use to communicate feedback that is saved to a SharePoint List and optionally emailed to a recipient. This Add-in for SharePoint 2013 online allows a user to add a new Add-in Part which will allow users to communicate feedback that is saved to a SharePoint List. 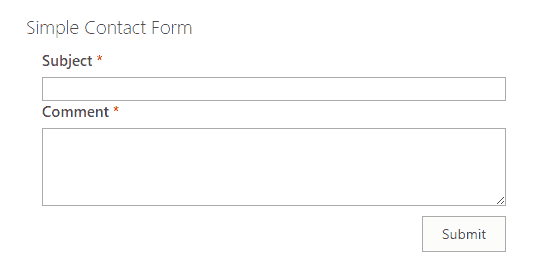 The Simple Contact Form Add-in Part provides a form for a user to submit a Subject and a Comment to a list and/or an internal email recipient. The feedback will be saved to a configurable SharePoint list and optionally a recipient can receive the comment via email. Organizations typically use this Add-in as a suggestion box on their internal Intranet pages. The Add-in Part can be added to any page on a SharePoint site.